Fords 4.6 and 5.4 liters are in many vehicles such as trucks, vans, and cars. The 4.6 started out in 1991 in the lincoln`s and progressed from there with many up grades along the way. The 5.4 started out in the 1997 in trucks and vans. Both engines came with duel over head cams for special cars and trucks. There are to many to list, so we will stay with the most popular. The 4.6 liter came in both the rear wheel drive and front wheel drive cars. Please see below for some off the big sellers. Please call for all other prices for all the different 4.6 liters not listed above! *Please call for all other prices for all the different 5.4 liters not listed above! 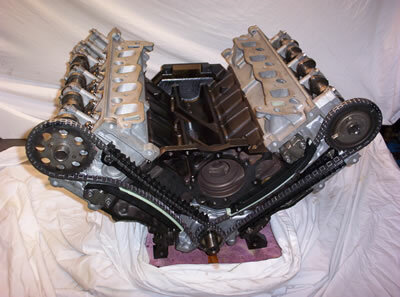 All engine exchanges must be in rebuildable condition on an exchange basis.